Step 1 – Blackjack is a game that almost everybody in the modern world knows how to play. To begin, select your bet, and place it on a spot on the table, any will do fine. Now you are ready to deal those cards. 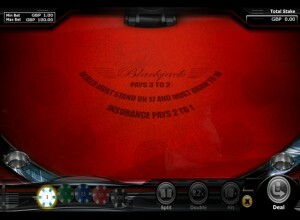 Step 2 – Online Blackjack is no different than the land-based game in any way. You'll be handed two cards which you must make your cards tally up to 21 (named Blackjack) or as close to that figure as possible without going bust (going over 21). Aces count as both ones or elevens so remember that when you play! Step 3 – Once you've got you cards there really is nothing to it. Remember the dealer must draw to at least 16, and if you happen to pull off Blackjack then you'll be rewarded with a 3 to 2 pay out. Keep in mind, the dealer must stand on 17 or higher, he will not twist/hit (take another card) if he has 17. Blackjack is one of the most popular games anywhere in the world, whether it is played at home or in casinos (both land-based and online) and arcades. It is a simple game that can be taught to infants very rapidly, with no effort needed to learn it. Playtech's Black Jack game also features a free Black Jack function which allows you to practice away at the game before you play, just to get the hang of it, though I can assure you, that you won't need much practicing. It is that simple. As for the look and feel of the game itself, I like it. The ocean blue swept board compliments the game, and drives it away from that stereotypical overused and frankly quite ugly pool table green that you see in so many other online casinos. There is no complications with bonuses or additional buttons either. You simply have the bet, re-bet, and clear all bets button, easy as pie don't you think? Black Jack is available in every online casino, although we'd recommend William Hill Blackjack as one of the best, with the most gamers you'll find, I'd imagine. The minimum bet on William Hill Blackjack is £1 with the maximum £100, which is fair and about right, I'd say. Any higher and I'd question the legality of the game, any lower wouldn't be worth playing. After all, Black Jack isn't terribly difficult to win! Don't forget to also try out a little thing called Bingo Black Jack if you come across it. It's quite odd, but that's for another time. Trust us!